The Bauta Schiavoni Mask is the variation of a popular classic Venetian Carnival costume. Choose the Bauta Schiavoni if you prefer a genuine masquerade mask, Made in Venice, which shows off the craftsman’s skill. The artist has chosen to create the background for the ‘paintings’ using an aged look to make the mask look ancient. And why does the Bauta Schiavoni stand out? Four individual decals (or transfers) picturing classical Venice decorate the mask - and they look stunning. Each represents its own piece of artwork, depicting Venice's architectural landmarks like the Doge's Palace. The decals are intricately framed in white paint, forming a scroll around each one, to give an almost 3-D effect. A masterpiece? Without doubt. And a conversation piece? Unquestionably. The perfect choice if you want to be artistically different at your masquerade ball or themed event while taking on a more unassuming character. 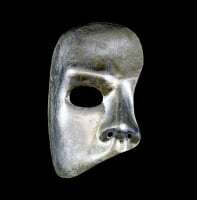 In 16th century Venice the Bauta was the whole costume, of which the mask played a part. Equally popular with men and women in medieval times, it's a great choice for men for today's themed events. The Mascherari – Venetian mask makers – were respected in society for their craft and enjoyed special privileges. It would be another two centuries before the Carnival was revived and today, the tradition is here to stay. The Bauta Schiavoni is a work of Venetian culture you’ll want to keep to remind you of your event and the part you have played in keeping tradition alive. Wear your mask with confidence and ease - it ties in black satin for a comfortable fit. And, it is designed to fit around the face with space for eating and drinking. 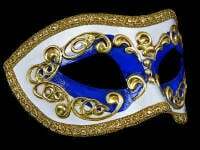 This masquerade mask certainly gives credit to the original and you will stand out if you make it your special occasion choice. 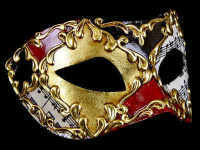 All our masks are delivered free direct to your doorin the UK.